A cow is prepared for milking at the Iowa State Fair. The first spray of milk is squirted onto the floor before the teat is connected to the milking machine. For decades, the federal government has stepped into that equation to keep things stable in the dairy industry. But Fick and other dairy farmers say the government’s current safety net program does not work. Fick is enrolled in the Margin Protection Program, a form of government-subsidized insurance that came online with the 2014 farm bill, the massive law that governs everything from food stamp benefits to farm supports, including the dairy program. Farmers pay a flat fee to join the Margin Protection Program and they get a payout if their margin gets too tight — that’s the difference between the cost of feeding cows and the price farmers get for milk. They can pay extra for more coverage. 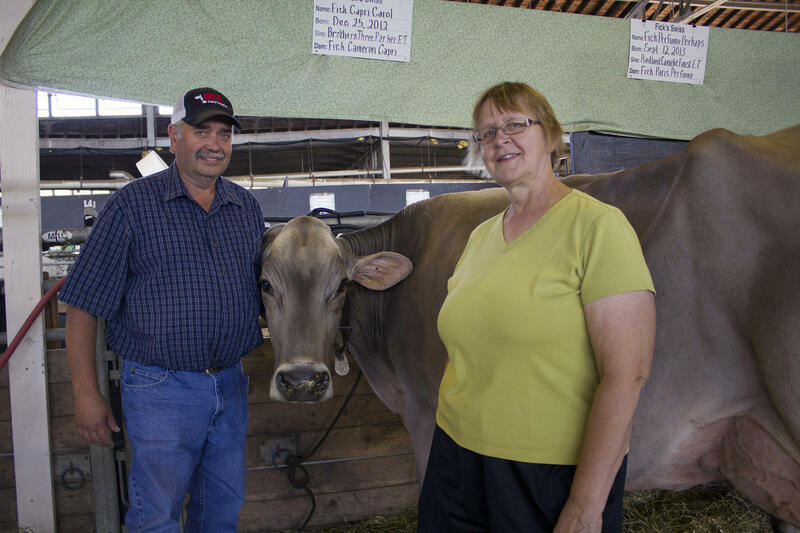 Galen Fick and his wife Sandy, stand next to some of their Brown Swiss cows at the Iowa State Fair, have a 50-cow herd in Boyden, Iowa. Even the U.S. Department of Agriculture, which administers the program, says it is not working as intended and will lett producers opt out early if they want. But Fick does believe some kind federal help is necessary. Twenty years ago, the U.S. had almost three times as many dairy farms as the 41,000 it has today. Why do we have too much milk with fewer dairies? Modern technology makes farms more efficient, but to make money, they must achieve economies of scale. And that often means growing much bigger; some have thousands of cows. 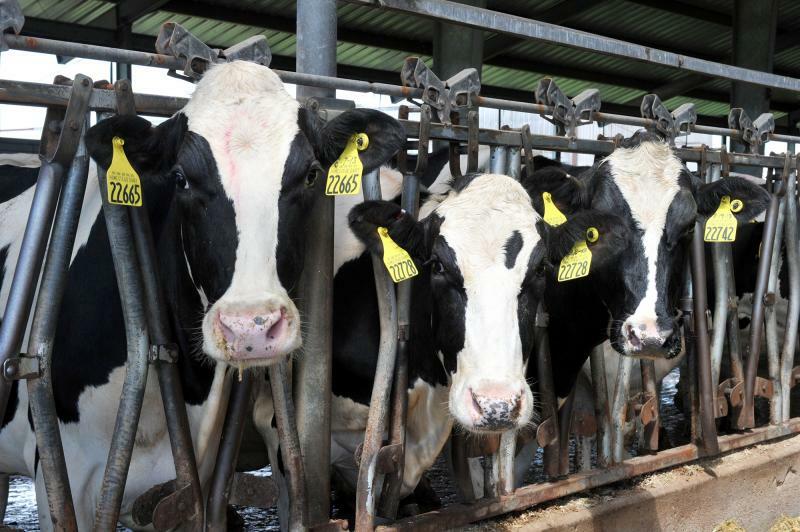 In March, the country had 9.4 million dairy cows, the highest number in 20 years. More cows mean more milk. U.S. farmers are left producing excess milk, and while much of it is processed into cheese, yogurt, ice cream and milk powders, which have a longer shelf life than fresh milk, the oversupply drags the price farmers get down even more. “You can't have a program that's too generous because it will generate too much milk production and ultimately be self-defeating,” National Milk Producers Federation vice president Chris Galen says, but adds farmers need to see tangible benefits. As Congress tackles the next farm bill, Galen says, it’s the time to make changes. Some senators have suggested the traditionally bipartisan bill could get through yet this year, well ahead of the fall 2018 expiration date on the current one. 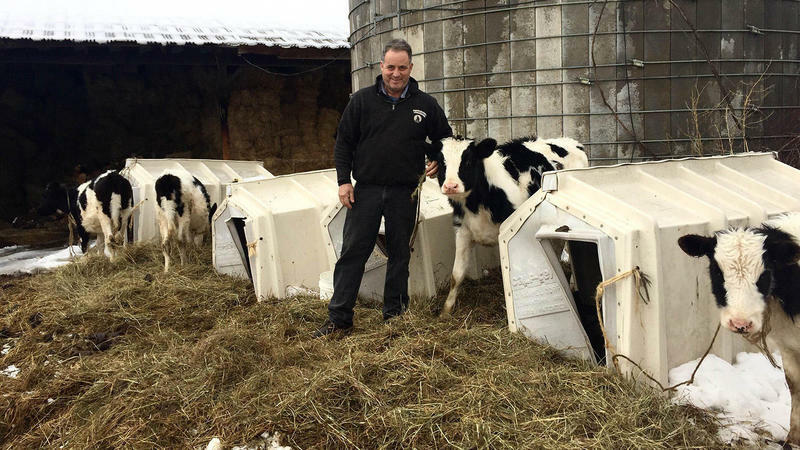 But Galen’s group, other dairy industry advocates and some farm-sector powerhouses such as the American Farm Bureau Federation will be pushing for reforming rather than replacing the program. For example, Galen says the formula the government uses to calculate margin is flawed. Galen says better math would calculate prices and costs more accurately. He says the government’s average prices for corn, soybean meal and alfalfa (all primary feed ingredients) underestimate what farmers are actually paying. In addition, he says the premiums farmers pay for coverage above the baseline need to be calculated every month rather than every two months. In the past, the USDA attempted to shore up falling prices by purchasing dairy products in times of surplus. But Galen says that program became very expensive and did not provide an adequate safety net. Still, even an improved program likely won’t please everyone. Matt Schelling, another northwest Iowa dairy farmer who has 150 cows near Orange City, says generally dairy programs have helped small operations like his. Dairies might be okay without subsidies, though that’s very much an open question. But there is no doubt about something else: They need workers. Many dairies depend on immigrant labor to do the daily, year-round, physical work. As Congress drafts the next farm bill, farmers will be watching to see whether anything from Washington, D.C., makes a difference in the dairy barn. Listen to Amy discuss the dairy safety net last week on KCUR's Up to Date. In Weathersfield, Vt., a town once dotted with small milking farms, about 60 cows peacefully chew hay at their home on Fuller Farm. They are the last remaining dairy herd in Weathersfield, and they'll be auctioned off this week. This is a growing trend in the changing dairy industry — in the state and beyond. Dairy Farmers of America settled an anti-trust lawsuit Tuesday for $158.6 million, ending a long-running case that accused the country’s largest dairy cooperative of creating a monopoly in the Southeast, driving prices down for its own farmers and forcing many out of business. Gigi The Cow Broke The Milk Production Record. Is That Bad For Cows? When it comes to milk production, Gigi the cow is queen. "She's the diva of all divas," says Robert Behnke, a Brooklyn, Wis., dairy farmer and Gigi's owner. And she's earned that diva status: Earlier this year, she produced more milk in one year than any other cow had done before — just shy of 75,000 pounds of milk, roughly equivalent to 8,700 gallons. That's triple the national average for a dairy cow to produce in a year.